Dreamweaver templating features allow you to manage repeating sections of your web pages, such as navigation, in a central file. Also see: Library Items and Includes. The techniques you will learn are applicable to any PVII menu system or widget. Dreamweaver Templates are a popular way to manage small and medium-sized web sites. A template carries your complete page layout and gives you the ability to update multiple pages at once. 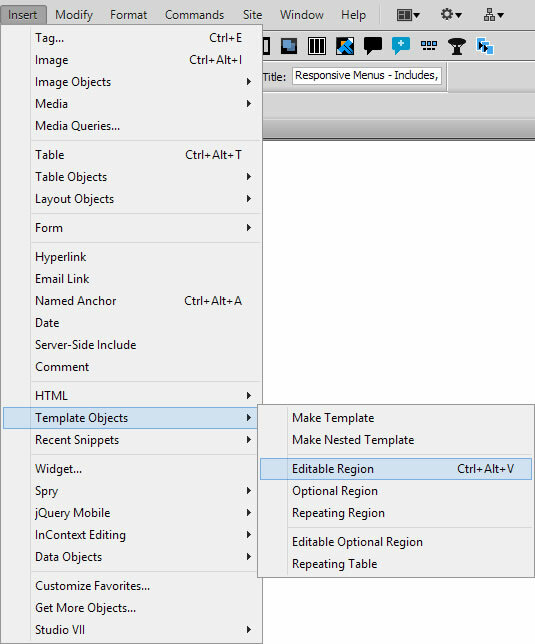 Dreamweaver Templates use a master file to manage your site design from a single local file. Dreamweaver places master template files inside a folder named Templates, which it creates in the root of your defined Dreamweaver Web site. Once you save your design as a Template you can use it to generate new pages or even attach the Template to existing pages. In order for Templates to function, you must work inside a properly defined Dreamweaver site. 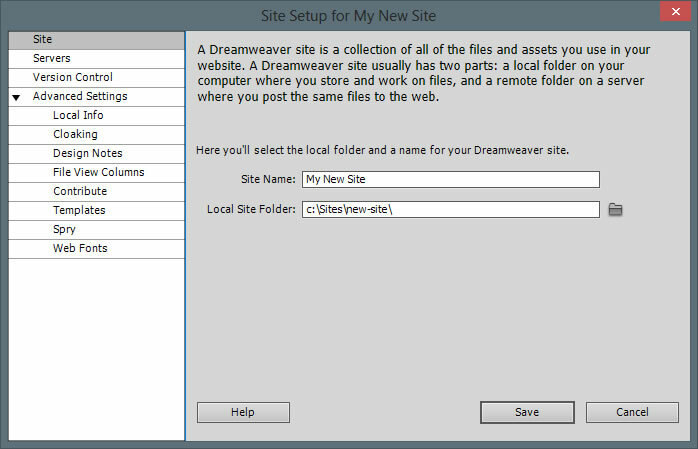 The Site category of the Site Setup dialog box is the only one you need to fill out to begin working on your Dreamweaver site. This category lets you specify the local folder where you’ll store all of your site files. 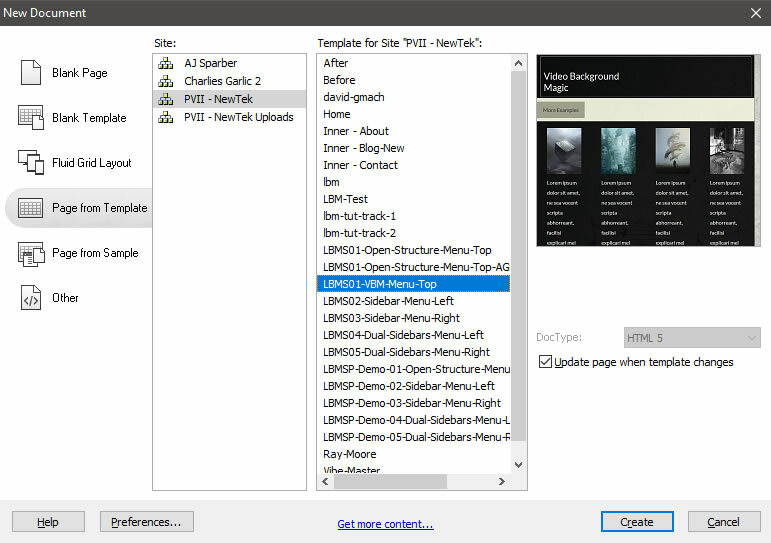 When you’re ready, you can fill out the other categories in the Site Setup dialog box, including the Servers category, where you can specify a remote folder on your remote server and enter FTP information (if you want) so that you can connect to your remote site through Dreamweaver to upload your files. You can also use dedicated FTP software to upload your files. For information on remote server connections, see this Adobe technical article. When your website has a lot of pages and you want them to share certain design features, you can create and apply a template to them. If you have a group of pages with an applied template to it, you can change the information of the group by editing the template and then reapplying it to those pages. You can do that while keeping the unique elements of each page unchanged. Define your site and create a page which will be used to create your template. You can create a new page, design it, and then save it as a Template—or you can save an existing page as a Template. To do so, open your page and choose File > Save as template. The Save As Template dialog will open. 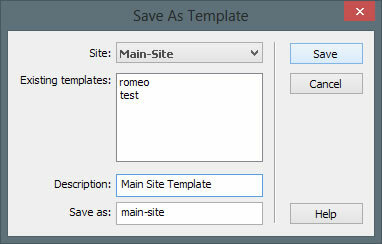 Choose a site (one of your defined sites), enter a description and a file name (in the Save as box). To work in your Template make sure that the site you saved it in is the currently active site in Dreamweaver's Files panel. Now you have a template with an editable region in it. The New Document window will open. Pictured below is the window in CS6. Your window design may be different if you are using a different Dreamweaver version. Select Page from Template in the first column. Select a defined site from the Site list in the second column. Select a Template from the third column. DocType will be grayed out if you've defined a default type in Dreamweaver Preferences. Leave Update page when template changes checked. Your new page will be created. Before editing the page save it within your defined site. 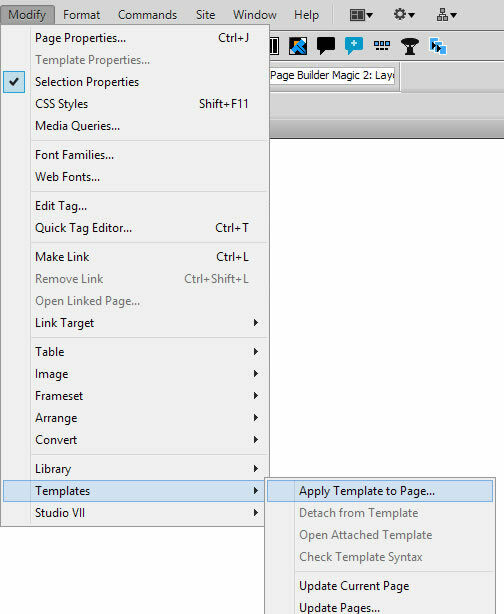 Dreamweaver allows you to apply a Template to an existing page. We recommend doing this if your existing page is very simply laid out. Tip: It is often easier to make a backup of your existing page, create a new page from your Template and then copy the content from the existing page's backup to the new page. The Inconsistent Region Names window will open. Choose the editable region in which to add your unresolved content. Head content should usually be resolved to Nowhere. 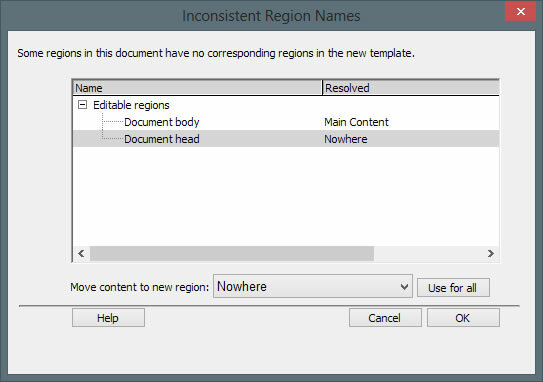 Document body content should resolve to the main content editable region you set up in your master Template. Once your page is attached to the Template, you can clean up any content you do not want. When you apply a template to a document which contains existing content, Dreamweaver attempts to resolve the existing content to a region in the template. If you are applying a revised version of one of your existing templates, the names are likely to match. If you are unsure what to do, click the Help button in the interface to access Adobe's documentation. You can undo a template application if necessary (Edit > Undo).